Good forward thinking, right? Evidently not… Last week I discovered a had a folder full of photos of the cake, but no recipe! Somewhere amidst my travels, working on my book, and my generally disorganized computer files (project for the new year: tidy those folders up! ), I lost the recipe… I found vague notes, but nothing more. So I set out to recreate it. 10 cakes later, no less, I finally have something most delicious to share with you — completely different from the original, and about a thousand times better too. Definitely worth all the remake efforts. I’m particularly excited about this cake because of its wonderful texture. You’d really never know this is a gluten-free or even grain-free cake at all. I bet your grandma wouldn’t believe that no eggs were the cause of the fluffiness in here… And no “gums”, binders, or oils in there either. Its very springy, stays moist for days, and has a most comforting soft and light texture and crumb, as a cake should. The pine nuts are optional, but they add a nice seasonal wintery touch and a nice soft texture and beautiful accent flavor — aim for fresh and fragrant ones for a most delicious treat. 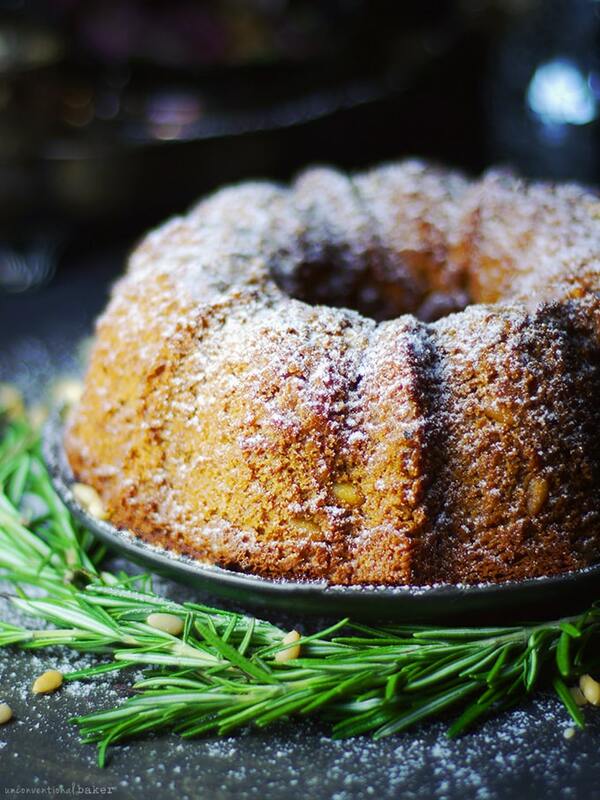 If you’re interested in a nut-free version of this cake though, use the cake from this recipe as a base, and just work in some finely chopped fresh rosemary and pine into it as your add-ins. Lastly, I made this in my 6 cup bundt pan (this is the one I use), so you’ll either need to multiply by 1½ if you want a 9 cup standard cake, or just have a shorter 9 cup ring. Or bake this as a loaf or a layer cake, or in a square pan instead — all good options. But there’s something fun about a bundt and about smaller cakes :) . Note: if you’re swapping out pans, just beware the cake rises quite a bit so leave room for that. We’re enjoying this cake right now. As I type the winds are howlin’ outside. The fireplace is going. Cozy cups of drinks are at arms’ reach. Ready for the evening’s festivities. I’m glad I saved this cake for the occasion. It is most fitting of a warm and magical night like this. 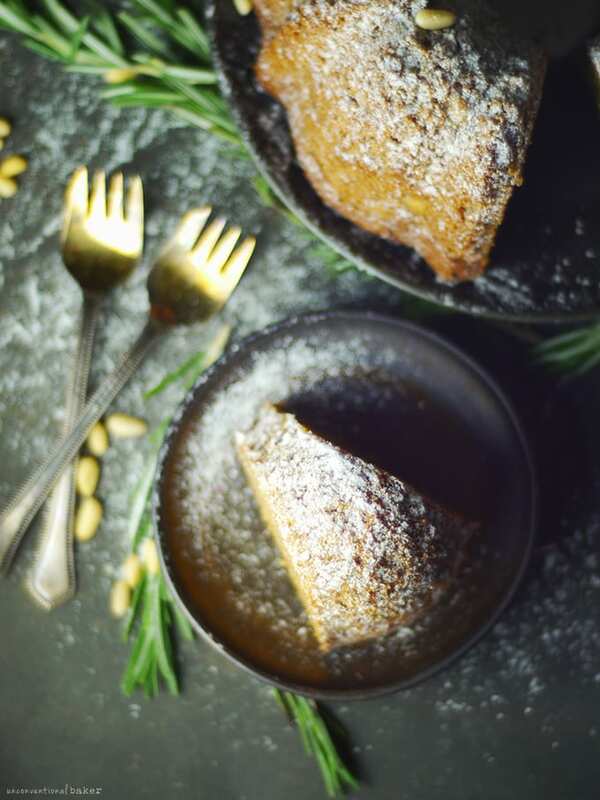 A warm, sweet, nutty and fragrant gluten-free cake with excellent texture. Dairy-free. Preheat oven to 350F. 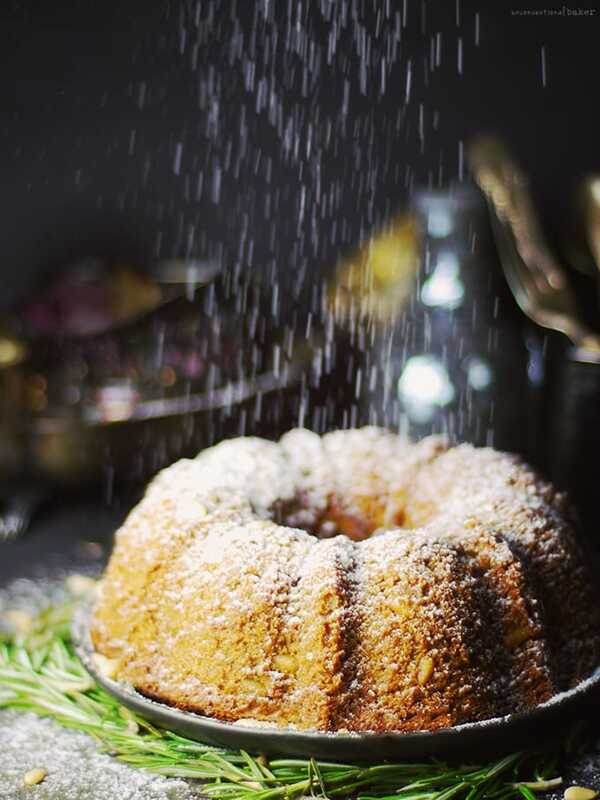 Oil a 6 cup non-stick bundt pan well. Set aside. Blend all wet mixture ingredients in a blender until smooth. Add all dry ingredients, except pine nuts, and blend until smooth once again. Add in pine nuts and pulse briefly to fold them in. (Note: I used my Vitamix for this step and used my tamper to help the blending process. If using another blender, you’ll likely need to pause and scrape down the sides every so often). 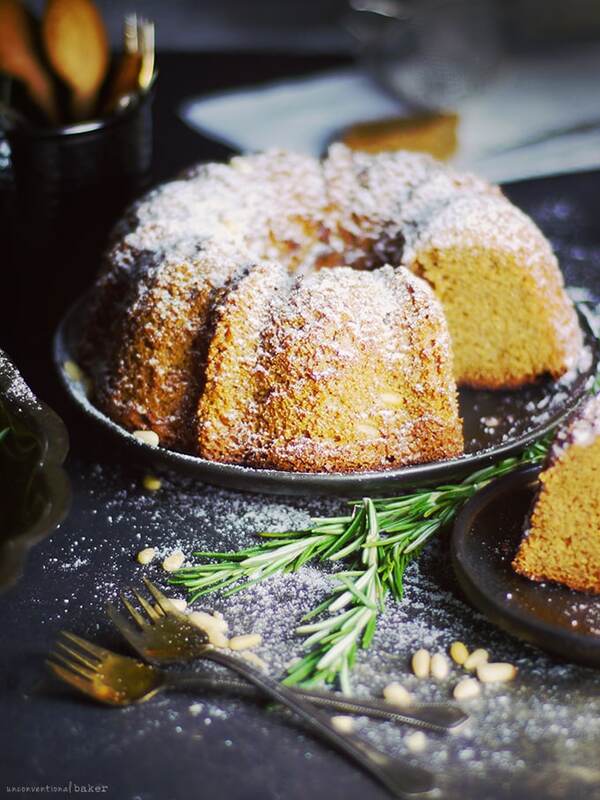 Immediately pour the batter into the prepared bundt. Bake in a pre-heated oven for 45-50 mins, until a skewer inserted in the center comes out dry. Cool on a wire rack for at least 10-15 mins, then carefully loosen the sides and flip the cake out of the pan and allow it to cool completely. Prior to serving, dust with coconut milk powder and enjoy! 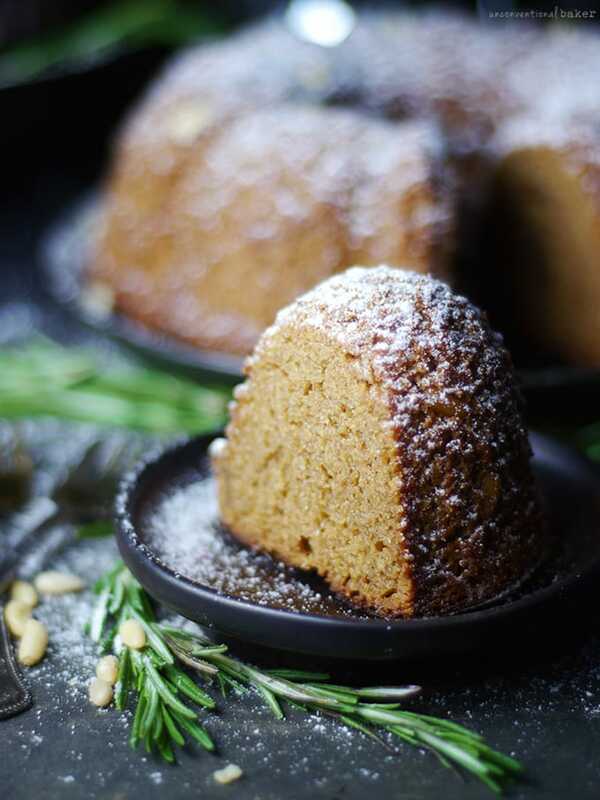 This post contains affiliate links to the bundt pan and Vitamix I used to make this, as well as to the chickpea flour and coconut milk powder used in the cake. 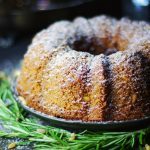 I would like to know if I could make the almond rosemary cake in a bundt 9″ but I would like to know the ingredients for the 9″ bundt cake please. I would like to make it for Christmas. Thank you. Can I add coconut flour instead almond flour? Unfortunately not in this recipe. Coconut flour works completely differently in baked goods and would not be a good substitute. You can try another nut flour if it’s just almonds you’re trying to avoid. Otherwise, you might want to check out the nut-free cake section on the recipes page. There are lots of recipes for treats with coconut flour there. Do excited to try! Can you make a printable link for the recipe! The texture and crumb of this cake are truly astounding. I can’t believe the GF flours in this recipe produced such a wonderful chewiness and rise. I made it last night with a few substitutions out of necessity (I didn’t have almond butter or prepared applesauce, so I blended 6 heaping tbsp raw cashew pieces and 1/2 cup chopped apple into the liquid ingredients called for in the recipe). The cake turned out absolutely delicious. My husband and I shared it for dessert last night and again this morning (delicious dunked in espresso, by the way). I did have a problem with the outside of the cake cooking too quickly while the inside remained under baked, but I think it’s because my bundt pan is evil and incapable of cooking the contents evenly (it is a dark, thick pan, which I think will be going straight into the bin for burning one too many cakes). I will make this cake again and again, in a regular pan! Thank you for yet another delicious recipe, Audrey! Hi Lena. Thank you so much for sharing. So glad the cake turned out will and those substitutions sound great. A bad bundt cake pan is always an issue.. :S I’ve experienced this as well. It’s a shame because at least with a regular pan you can always line it with parchment and you’re good to go, but bundts are a bit trickier. I’m glad the cake turned out ok after all. Thank you so much for giving us so many fantastic recipes! And the photography is just gorgeous. I particularly love this cake, the flavor is amazing. Unfortunately, though, it tends to rise beautifully before it collapses into a fudge-like (but not in a nice way) substance. The batter is very (VERY) liquid when it goes in, and it tends to burn on the outside before it’s cooked through. Hi Andrea, thank you so much for sharing your experience. As you probably know, I don’t bake in weights, so it’s a bit tough to figure out exactly what might have gone wrong, but just checking the first ingredient — agave — from what I can see online that conversion doesn’t seem to be right. 1 cup of agave apparently = 300 gr, so 3/4 cup should be 225 gr only (not 325 gr). 1 cup apple sauce apparently = 255 gr, so for this recipe the 1/2 cup should equal about 112 gr (not 185). I checked almond meal as an example as well as an example from the dry mix, and 1 cup almond meal = 100 grams (not 180 gr), etc. So the conversion definitely seems to be the culprit here. If you were’ multiplying by 1.5 for a 9″ pan, the amounts are still not quite right, as for example the agave would then need to be 336 gr (not 325), the apple sauce would need to be 168 gr (not 185), etc. Rising and collapsing is often due to too tight a space in a pan (due to too much content), which makes sense based on your description of what’s been happening (i.e. a higher volume of ingredients than the recipe calls for). The altered ratios of ingredients can definitely cause issues like this as well. Either way, sorry it didn’t work out as planned. I appreciate you sharing though, as I think it’s important to share what works and what doesn’t and can be helpful for others “to compare notes” with, as you say. This looks amazing! What a great combination of flavors! Thank you, Eden! :) It’s nice and cozy for the cold weather days. What can be a ” liquid sweetener of choice” that will make it too much or less sweet? Brown sugar can work?…although it’s not liquid?…. Hm… interesting question. I haven’t tried it, so I can’t guarantee, but I don’t see why it wouldn’t work. You’ll need to add a bit more sugar (because agave is sweeter than sugar — so I’d add another 3-4 tbsp extra sugar to be close to 1 cup), and a bit more liquid to the recipe — I’d guess maybe 3-4 tbsp water or applesauce in that case. If you try that I’d love to hear how you go. Gosh I’m so sorry I missed your comment somehow!! :S Eeek! It still sounds delicious though — I bet it was amazing with the orange in there. Another thought is the pan size. I think the 8″ springform has a larger capacity than the 6″ bundt, so you’re bound to end up with a flatter cake as a result (not a bad thing, just a different shape…). On that note though — I’m glad to hear it worked in a springform. I was asked that by someone and wasn’t sure how it would work out. Thanks for sharing! You never fail to amaze me with your creations Audrey! So creative <3 I love rosemary in baked goods, and the burst of almond flavors sounds amazing as well. Aw, thank you, Lucie! I’m super curious to try rosemary extract next, if I can ever find it.. Thanks so much, Harriet! ♥ Happy New Year btw! You sound like me! I hate it when I forget how I made something and end up making countless recipes before I land on something usually entirely different but very delicious. 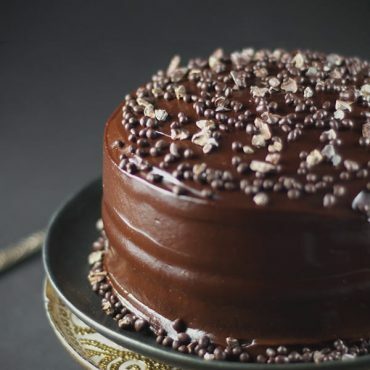 If I don’t write it down right away forget about it…I love the ingredients in this cake. I have been oddly in the mood for rosemary recently so it is perfect timing for me. I love that you took the flavor inspiration from Nissrine’s cookies and made cake, it’s absolutely gorgeous Audrey! The photo of that one snow-capped piece on the plate is so endearing for some reason, I can’t stop staring. I think it’s the perfect spongy texture, makes me want to devour it and hug it all at once :) Bummer about losing the recipe, although ten cakes later I have a feeling this version is even better than the first! Wow, this is stunning!!!! The texture and crumb does look so perfect and I love those savory-type flavors with it! The magic in that flour blend is the arrowroot and chickpea ;) Good good stuff! Hahaha! Yes, I must say I’ve really been under-using chickpea flour — must use it more. Worked so well here! This is absolutely beautiful Audrey. 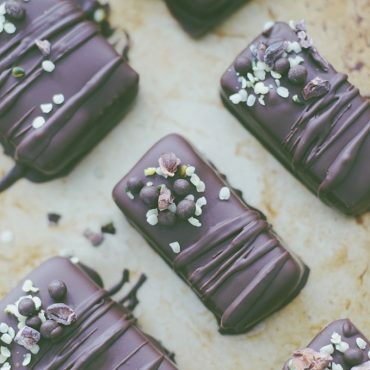 I love the recipe and these gorgeous photos. So honoured that I could inspire such culinary genius. Merry christmas my friend. Hi Rosie, yes, I think mashed banana or plantain would work well. As for the chickpea flour, can you do coconut flour? I tried it with that and it worked quite well. Buckwheat could work too, but I haven’t tried, and my only hesitation is that both chickpea & coconut flours are VERY moisture absorbent, whereas buckwheat not as much, so if you go the buckwheat route maybe reduce the amount of water a little. Then again bananas blend a little thicker than applesauce so you may be good after all :) If you try it I’d love to hear how it goes.